Calcite is a mineral that is treasured by collectors for its fascinating diversity. Some time ago we acquired some unusual specimens from the estate of a collector who had travelled the world acquiring rare minerals. Among them were some large gemmy crystals in a vivid reddish purple. We faceted several pieces and were delighted with the color saturation and translucency. The cut stones displayed a wonderful glow when backlit. One of these gems has been certified by The Gemological Institute of America (GIA) as Cobaltocalcite, a rare calcite colored by traces of cobalt. 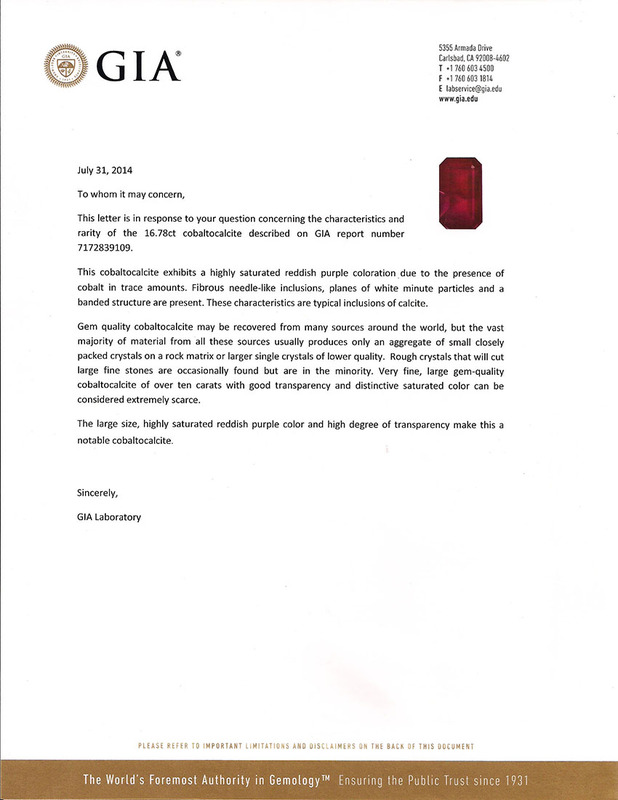 In addition, GIA has issued a special letter identifying this as a notable gemstone. For more information, see our article on Rare Gem Cobaltocalcite.